Why A Protective Alloy Layer Hardness Is Not High? Home > FAQ > Why A Protective Alloy Layer Hardness Is Not High? One of our overseas customers bought some bimetallic barrels from China, they found the hardness of the alloy layer is different, the alloy layer thickness is different, and relatively the wear-resistance and the working life is different. As a bimetallic barrel and bimetallic screw creator in China, they usually ask us the reasons. 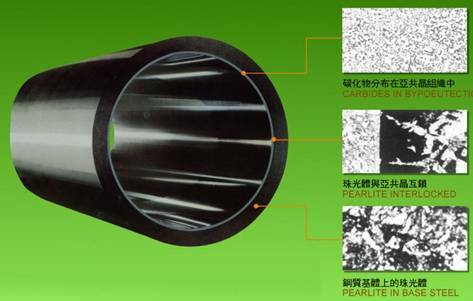 As everyone knows, the alloy layer can be wear-resistant, due to under a high temperature , the alloy elements in layer would be liquefied and combined respectively with the carbon atoms, formed different kinds of carbides. These carbide particles is very small and its hardness is very high, so can called as "hard phase". For example our wear-resistant iron Ω101 alloy, which was early researched by our company and widely used at present, after liquefaction these elements were formed in the nickel carbide, chromium carbide, manganese carbide, boron carbide and silicon carbide (See below). It is due to the anti wear function of these hard phases, the alloy layer can be truly worthy of the name "Protection layer" for a barrel. So, what kind of standard alloy layer can really protect a barrel? We believe that as long as meet two basic technical conditions. One is the layer thickness should be in the range of 1.5~2.5mm, and its hardness, such as Ω101 alloy with HRC 58~64, should be uniform throughout the alloy layer. Second is the alloy layer and base metal interface should be interlocked in micro metallographic, and should be clear in the macro, like pictured. But if the alloy layer forming temperature is not stable, low temperature will let the alloy layer can not be formed, but too high temperature will not only damage the carbides, but also will activate at low-carbon on the base material interface, to create a conditions for the hard carbide phases to transfer to the base material. These two results will reduce hard phases proportion in the alloy layer, lead to the hardness drop down. Similarly, if the centrifugal force is instability in the forming process, if the force is low, it will not be able to form the alloy layer; and if the centrifugal force is too high, it will make the carbide hard phase to be different segregation distribution in alloy layer based on they different specific gravity, can also reduce the hard phase proportion in the alloy layer, also leads to a decrease of the hardness. Many domestic bimetallic barrel manufacturers are restricted by conditions and often use a low-power electric furnace to heat the barrel, one of inherent defects for a low-power electric furnace is slow heat and long time, which creates a condition for the hard phase particles to be scaling lost and transferred. The molten atoms with only carbon contents 0.45 in base material which is on the junction with the alloy layer, in the condition of high temperature with a long time, accept the rich carbons in alloy layer, lead to reduce its melting point, these free atoms between solid-liquid, due to with they smaller specific gravity, move to alloy layer by a centrifugal force, and continuous adsorption of new carbon atoms, decrease the carbon content of the original alloy layer. On the other hand, alloy elements with a larger specific gravity inside the alloy layer, move to the solid-liquid interface by centrifugal force, thus forming a new diffusion interval on the solid-liquid interface between the base metal and alloy layer (Below picture), this diffusion interval not only attracts the iron atoms with smaller specific gravity, but also attracts carbide hard phases with large specific gravity. The result is the standard proportion of carbides reduced, the standard hardness of alloy layer reduced, and the wear-resistance feature reduced. Due to there is a new diffusion zone, lead it is almost impossible to judge the Intersection line clearly between the alloy layer and the base material in the macro with the naked eye. This phenomenon of alloy layer is not clear can help us simply to determine whether the carbides in alloy layer have been transferred already, whether the hardness and abrasion resistance reach the standard. The mark on barrel end face is “OMEGA”. This really tells us a simple way to judge what is a standard bimetallic barrel. Chief Engineer Office / Shanghai Omega Machinery Co., Ltd.